With the recovery of two more bodies today the death toll rose to 5 in the Friday’s flash flood and landslide incident. Capital Deputy Commissioner Prince Dhawan informed the Police and SDRF team still searching the missing persons and so far only three bodies were recovered in the Itanagar and Naharlaugn area. On Friday’s flash flood, three member of a family was washed away from Modirijo area of which the youngest members of the family a small child of aged around 3 years Late Kojum Beyong was retrieved from Papu river at around 6 AM near Oju Mission School. A lady Yadi Regio from Jamijate area who was rescued by local people and police from same stream was admitted at Hospital with multiple fracture later succumbed to injury while the third body of Late Mohan Bahadur Chetry was recovered by the team of NDRF 12 Battalion from Dikrong river near old NIT area of Nirjuli. Two team constituted on Friday under the close supervision of Commandant Umesh kumar Thapliyal which have been led by Assistant commandant Sanjay Prasad Sharma began the search operation today early morning from both location. 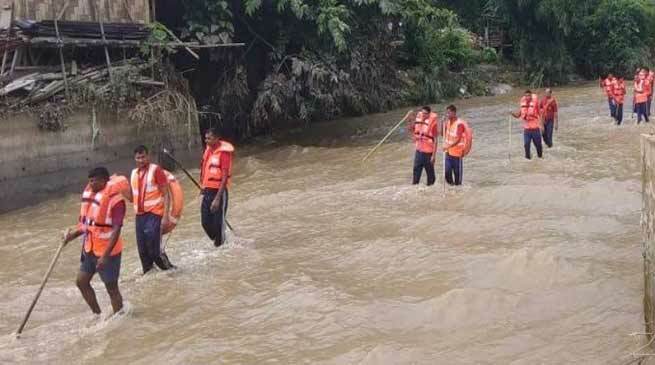 The 1st team consist of 19 members while 2nd team consist of 34 members with all required technical and support and materials engaged in the job to locate for the three missing body along the stream and later in river Dikrong toward downstream. The team at around 11 AM able to recover body of a male from 300 metres towards Harmuty Tea Garden who was identified as Rigio Tagung, aged around 60 years, the body was handed over to the relatives for conducting last rite. NDRF Deputy Commandant P N Singh inform that the search operation have been halted for today and again the team shall start operation tomorrow early morning to search for the last body.